This collage shows magnetic fields in the interior of the sun simulated using a solar dynamo model (center) and the observed solar corona at two different phases of solar activity: A quiescent phase during the recent, unusually long minimum in solar activity (right) and a comparatively active phase following the minimum (left). The source of a mysterious drought of sunspots in recent years apparently originated beneath the star's solar skin, investigators find. Sunspots are dark, cooler regions on the surface of the sun dominated by intense magnetic fields. These are the seats of storms of charged particles that generate beautiful auroras on Earth, but can also ravage electronics in space, affect air travel over polar regions, and zap power grids on Earth. This visible-light photograph, taken in 2008 by NASA's Solar and Heliospheric Observatory (SOHO) spacecraft, shows the Sun's face free of sunspots. The Sun experienced 780 spotless days during the unusually long solar minimum that just ended. New computer simulations imply that the Sun's long quiet spell resulted from changing flows of hot plasma within it. "Sunspots have been more or less continuously observed since Galileo trained his telescope on the sun in the early 17th century," said astrophysicist Dibyendu Nandi at the Indian Institute of Science Education and Research in Kolkata, who led the study. The sun periodically sees an ebb and flow in the number of sunspots, a cycle that lasts approximately 11 years. However, near the end of Solar Cycle 23, which peaked in 2001, solar activity entered an unusually long "minimum" with a large number of days without sunspots and a very weak polar magnetic field. "One has to go back almost 100 years to find a solar minimum with a larger number of spotless days," Nandi explained. However, this drought ultimately did end in 2009. The sun is currently in its next weather cycle, Solar Cycle 24. To understand how the sun lost its spots, scientists developed computer simulations of the sun's magnetic field to simulate 210 sunspot cycles. This image generated from computer modeling shows that a deep minimum in solar activity occurs when the magnetic field belts of two successive cycles (blue and red regions in the right) become separated in space and time due to changes in solar internal meridional plasma flow. second half, leads to a deep sunspot minimum, effectively reproducing the Cycle 23 minimum the sun underwent. "The results are exciting because it demonstrates how small changes in the internal dynamics of our parent star, the sun, can profoundly affect our technology-based society," Nandi told SPACE.com. These spotless days led some researchers to suggest that we might be seeing a repeat of the Maunder Minimum, a 50-year cold spell of sunspots that some researchers have linked to the Little Ice Age of the 17th century. Nandi and his colleagues Andres Munoz-Jaramillo and Petrus Martens detailed their findings in tomorrow’s (March 3) issue of the journal Nature. It remains uncertain what induced these meridional flows to change speeds that caused the sunspot drought. 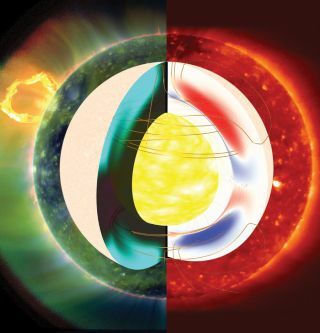 This meridional circulation is driven in part by the energy drawn from the roiling solar interior and small temperature differences between the solar equator and the poles, and variations in this circulation can be caused by changes in these factors or by the feedback of strong magnetic fields on the flows. "We do not understand the intricacies of these processes to a great detail," Nandi said. Still, in principle, one could extend this model, in conjunction with observations of solar plasma flows, to make short-term forecasts of solar activity, Nandi suggested. "We can predict if we are going to have fair weather in space and over polar regions for a sustained period in time and use this knowledge to plan space missions and schedule air traffic on polar routes," Nandi said.